Magic has a lot of formats. Some of these are sanctioned and approved and have products released just for that crowd. Others are fleeting and ephemeral, gone almost as soon as you heard about them. This is just another reason why Magic is going into its third decade: the structure of the game allows us to use our creativity and our skill to build new ways to play with the same cards. Not every format has a financial implication for those of us that seek to increase the value of our collections, though. Horde Magic is a good example of this, since you’re just using whatever deck that you want vs. the Horde deck. Sure, some tokens might go up in price, if someone decides they suddenly need 75 Wurm tokens, but mostly that format utilizes decks people already have, just in a new way. Cubing has a restriction stopping it from being the most popular format of all: consistently getting eight people together for a draft. What do you do when a ninth person shows up? Ten? Cube, and its smaller cousin Battle Box, is tricky to find financial examples for, because almost all the cards that are good in Cube are good in lots of formats. Cube is one of two major formats that asks for one of a card, though, and that leads to premiums on foils. 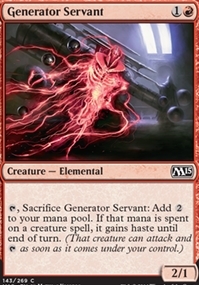 An example of Cube’s effect on a price is Generator Servant. The regular of this common is less than a quarter, and yet the foil is $3. It’s too small an effect for EDH (I’ve got two creature-focused decks that could use it and yet I don’t) but it is great in a lot of ways for a Cube. 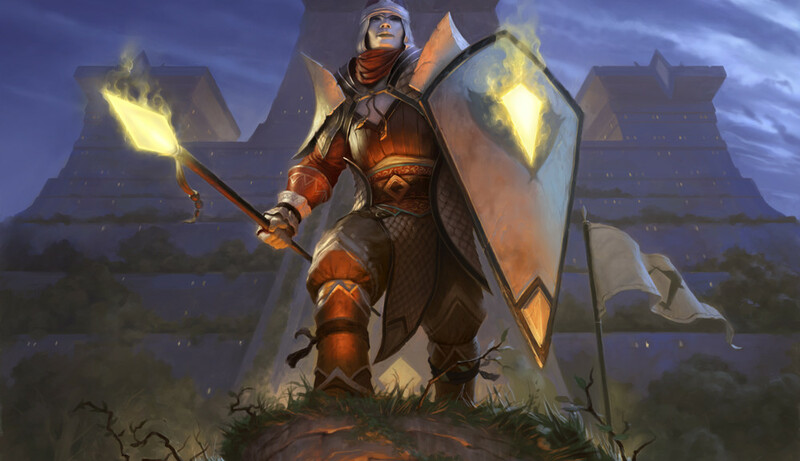 Commander is the prime example of a casual format that has had profound and lasting effects on card prices. It combines several traits that have led to a sustained price increase. First, it’s got a relatively small banned list. You can play almost any card that has ever been printed. EDH came along at the perfect time to make old collections useful again, and in a casually exciting way. Commander games are built for the long haul, with bigger decks, bigger life totals, and splashier spells. You occasionally see Standard decks casting Genesis Wave or Villainous Wealth, but those are outliers. Constructed decks aim for consistency, while Commander’s deckbuilding restrictions make it difficult to have games play out the same way over and over. Finally, the H in EDH is for Highlander, meaning “There can be only one! 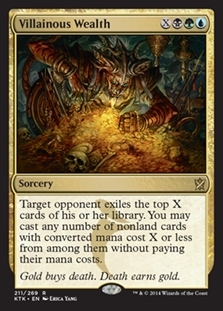 (of a card)” and that contributed to a huge demand for foils. If you can only have one of a card, might as well make it foil! The Tiny Leaders variant of Commander is the newest format to shake up our decks and our viewpoint on what a card ‘should’ be worth. Tiny Leaders is not Commander, don’t make that mistake. TL games are meant to be shorter and faster, and are duels. It’s true that there’s already an ‘official’ 1v1 Commander variant, but Tiny Leaders imposes a new restriction in mana costs and that bypasses a lot of current Commander decks. You can tweak an existing EDH deck for the 1v1 style, but you have to build a whole new Tiny Leaders deck. Since you care about the financial implications, think about what new formats mean: New decks being built. On MTGO it’s only necessary to have four of a card and you can have unlimited decks with that playset, with no logistical nightmare of moving cards from deck to deck. I’ve tried doing that and it’s awful. Maybe it’s not so bad moving your set of Polluted Delta from your Legacy to Modern to Standard decks every other week, but when you’re changing a Verdant Catacombs and a Twilight Mire from one deck to another and then back over the course of a casual Magic night, you’ll want to pull your hair out. One of the great lies of Commander is that you only need one of a card. You’re going to build decks in overlapping colors, and when you do, you’re going to end up getting several of the same cards, especially lands. When a new format like Tiny Leaders begins to take off, there’s an opportunity present for you to be ahead of the curve. I’m not saying you invest heavily in every new format, but think about how much you would have made if you’d bought Gaea’s Cradles in 2012 when they were $60 or so. No single event made Cradle spike, but it’s one of the most amazing EDH cards around. Elves in Legacy wants this card, but not so many as to cause this growth. In order for you to make money/value off of a new format, you have to understand what the format is doing and how it plays. Berserk, for example, has gone up $10 in the past three months, after being stable for years. I can’t say for sure that Tiny Leaders is why, but it fits the format perfectly: Low mana cost, intended to end a game fast, just need one, etc. I’m not here to say that Tiny Leaders is the next big thing. We all have our formats that we love and those we abhor. But if you get to know each format, whether or not you enjoy it or even play it, you’ll have a more complete understanding of how to value cards for it. That will lead to you making better financial decisions with these cards. Do a little research. Follow the links, click the hashtags, read the articles. People love to talk about their variant or their brainchild, and you’ll be that much more informed. ADVERTISEMENT: Tired of overpaying for card sleeves for your decks? CheapCardSleeves offers discounted prices and bulk packages on popular brands of sleeves including Ultra Pro, Dragon Shield, KMC, and more! Bulk orders of cheap card sleeves include free shipping to the US and they also offer flat-rate shipping for smaller and international orders. Next time you’re building a new deck, or a cube, save yourself money and get your magic sleeves from CheapCardSleeves! thanks for mentioning battle box. Wouldn’t have known otherwise. Hope you are getting a kick out of my German plateau. – Cube, while only 8-man on MODO, is not required to have 8 people to play. I would say most of my Cube drafts wind up being 6-mans, with a fair amount of 4-s and 8-s mixed in. There are also lots of people who play 1v1 with different draft formats, so I think your info there is a bit off. Odd numbers are always a frown, but your minimum threshold is off. – I would have loved to see a specific mention of Geist of St. Traft in your Tiny Leaders discussion, since demand for the card is WAY up across the board because of the format (which can be seen at Pucatrade, in particular, even before the bannings in Modern). EDH is retarded. Enough said. That was a well thought out and educated comment. I’m impressed that you were able to show your side and how you felt in two sentences and five words! I wish I could say things as eloquently as you have, but there can be only one.